Making sandwiches for a crowd are the perfect foods to prepare for some occasions. Sandwiches are generally made with two or more slices of bread making them perfect finger foods for parties or gatherings where convenient foods are needed. We know for hundreds of years that people have spread butter, jams and cheese on pieces of freshly baked bread. Bread has also been eaten with meats for hundreds of years while men were gaming. It is easy to perceive that someone would put two pieces of bread together to hold a piece of meat in the center. The history of sandwiches tells us with the rise of the Industrial revolution came the mass production of commercially made bread. Very soon most of this bread was sold presliced making it easy to put together sandwiches. Also as a result of the Industrial Revolution a new society emerged. This became a society where people were more on a move working jobs and needing convenient foods to take with them to eat. As the history of sandwiches will point out to us, this time is what exploded the popularity of the sandwich and it has never decreased since then. Today many of the fast food restaurants know what it is to make sandwiches for a crowd selling thousands of them daily. Lately the sandwich has been given a bad name as being very fattening and unhealthy. While it is true that some do have a lot of calories, there is still a place for these sandwiches. They are not meant to be eaten everyday or several times a day; one of these can fill you for a whole day. When cooking for a crowd, making sandwiches for a crowd also has a very important place. Sandwich recipes can be dressed up as with Monte Cristo sandwiches or dressed down like a simple ham salad sandwich recipe. When feeding a large bunch of children there is nothing any more convenient or appreciated to serve. 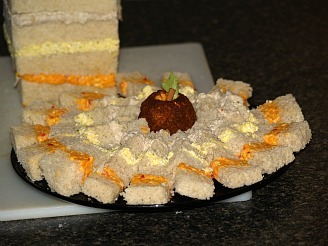 Party sandwiched can be served in different sizes and shapes on party trays or on buffet tables. There are certainly times and places where sandwiches are definitely needed. As I said when making sandwiches for a crowd, the Monte Cristo sandwich recipe has a special place. When I worked at Disney, we made hundreds of these. People that came there from everywhere loved this sandwich. If you are cooking for a crowd, the Monte Cristo sandwich recipe works very well for special luncheons served with a nice salad a fruit. Being that they can be prepped ahead of time, they are very convenient to serve. It is as easy as placing thin sliced of ham, turkey and Swiss cheese between two slices of bread (you can spread one slice with mayonnaise and one slice with mustard if you like). Layer on large trays, cover tightly with plastic wrap and refrigerate until ready to deep fry. When ready to serve deep fry in hot oil until golden, dust with powdered sugar and cut in triangles. After you have decided to serve sandwiches for your special occasion there are more decisions to be made besides what type of filling you will use. For instance, what kind of bread will you use and how thick do you want the slices. You can have the bakery slice your loaves of bread thinner than the normal. This means you will use less filling to make it comparable with the slices; thick sliced bread needs a thicker filling. Thinner sandwiches are great for children and for women; most men like a thick and filling sandwich. If your gathering is a combination, this problem is solved by serving larger sandwiches but cutting them in halves or quarters. There are many questions to answer when figuring how much filling you will need for your sandwiches. 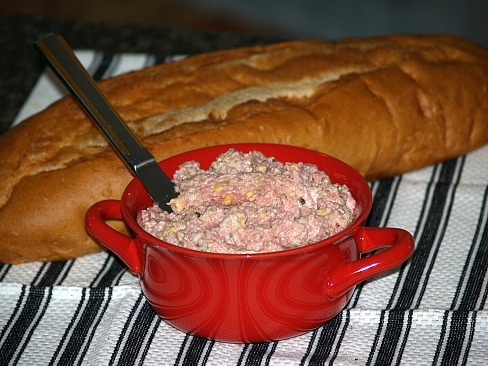 This is a filling for tuna salad sandwiches. It will make about 90 to 100 sandwiches depending on how thick you spread the mixture. You can use it on hamburger buns or bread. I like the pound loaves of sandwich bread. You can have a bakery cut the slices a little thinner and get more sandwiches per loaf. Refrigerate all ingredients until cold before mixing. Combine all ingredients in a large food container. The best way to mix is to put on sanitary plastic gloves and mix with hands. Refrigerate until ready to make sandwiches. If making sandwiches for a crowd, this recipe makes between 50 and 60 sandwiches depending on the thickness that the mixture is spread. Combine all ingredients in a large food container and blend thoroughly. 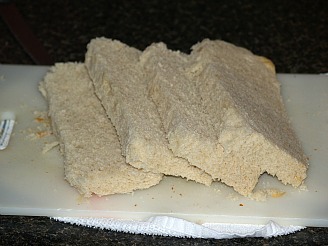 Spread between slices of sandwich bread. This recipe makes about 60 sandwiches depending on how thick you spread the mixture, if you need sandwiches for a crowd. Grind ham, boiled eggs, onion and celery; add relish, mustard and mayonnaise. Mix until well blended and spread between slices of bread. If you want to make cheese sandwiches for a crowd, this recipe will make about 30 depending on how thick or thin that it is spread. Combine all ingredients together and mix until smooth and creamy; spread between slices of bread. This recipe will make about 20 to 24 sandwiches depending on how thick you spread the mixture. Combine and mix all ingredients; spread between slices of bread. As I said earlier, when you are making sandwiches for a crowd, there are many ways to dress them up. Here is a way to use the previous recipes and dress them up. Use large unsliced loaves of white bread. Lay loaves on sides and slice lengthwise into 5 even slices (about ½ inch thick) note: You may want to trim the crust off edges first if for a dressing occasion but not necessary. Choose and have ready 4 of the 5 previous spreads. Spread the bottom slice of loaves with the cheese spread. Spread the second slice with another spread like chicken salad; place on top of cheese spread slice. 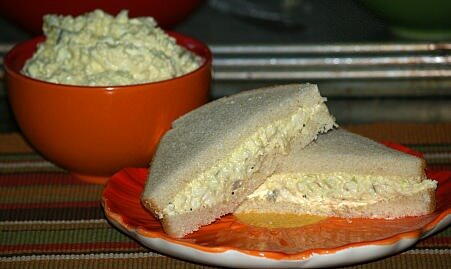 Spread the third slice with another spread like egg salad; place on top of bread slice with chicken salad. 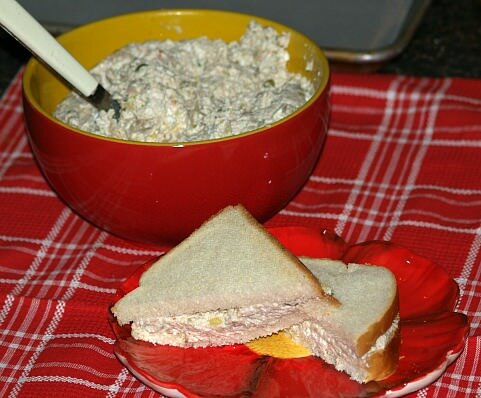 Spread the fourth slice of bread with another spread like ham salad; place on top a slice with egg salad. Top loaf with last bread slice. NOTE: At this point you can stop and wrap the loaves in plastic and refrigerate until ready to cut and serve. NOTE: If you want to dress the loaves up more, combine and frost the loaves. For each loaf beat until smooth and spread over top and sides of loaf. Refrigerate until frosting becomes firm before slicing. To serve these party loaves, after refrigerating, slice them vertically. It depends on how thick you slice these as to how many sandwiches you will have per loaf so these are easy sandwiches for a crowd. 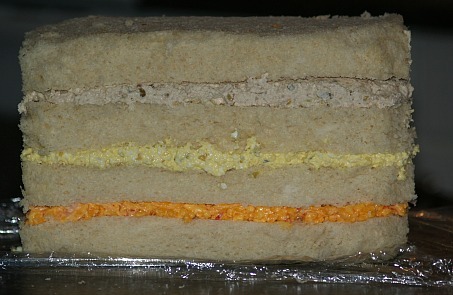 Each sandwich will have some of each filling in it. If making them with frosting, it is best to serve with eating utensils instead as a finger food. Make easy chicken Parmesan sandwiches for a crowd (For 24). NOTE: You can use your favorite canned spaghetti sauce or pizza sauce instead of making this sauce. TO MAKE SAUCE place 1/3 cup of oil in Dutch oven. Add onion and garlic; sauté until tender and lightly browned (3-4 minutes). Add tomatoes and cook until thickened about 5 minutes stirring occasionally. Remove from heat and stir in basil; season with salt and pepper. Pound chicken pieces into ¼ inch thick fillets; set aside. Line 2 to 3 large baking pans (With rims) with foil. Spread about ¼ CUP oil over each baking pan. Blend together the flour and black pepper in a shallow flat dish; set aside. In another shallow flat dish beat together the egg and water; set aside. Dump Panko bread crumbs in another shallow flat dish or pan; set aside. Season chicken lightly with salt; coat each with flour tapping off excess. Dip each into egg and then coat with bread crumbs; place in baking pans. Bake about 8 minutes; top each chicken with parmesan cheese. Next top with slices of Mozzarella cheese; bake 5 to 7 minutes for cheese to melt. Top each with sauce; return to oven until sauce is hot. Place chicken on crusty sub rolls of buns; makes 24 sandwiches. NOTE: Use about 8 thin slices corned beef when layering. Preheat oven to 475F degrees; coat about 3 baking sheets with non stick spray. Stir together the sauerkraut and caraway seeds; set aside. Spread dressing evenly on 1 side of each bread slice. Layer 24 RYE bread slices with cheese, kraut and corned beef. Layer 24 PUMPERNICKEL bread slices with cheese, kraut and corned beef. Place the layered PUMPERNICKEL bread on top of the layered RYE. NOTE: This makes “double decker” sandwiches. 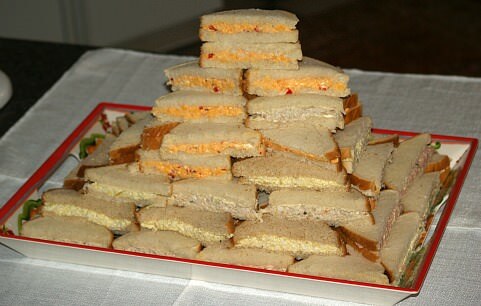 Top with remaining 24 RYE bread slices; place sandwiches on prepared trays. Bake about 15 minutes until golden brown and cheese slightly melted. Serve warm; makes 24 sandwiches.